Two fast-growing national restaurant chains are the first to sign up for the new restaurant and leisure destination at Middlesbrough’s Centre Square, with a bowling alley, sky bar and micro pub also proposed. Bistrot Pierre is taking 4,080 sq ft on the ground floor underneath the Holiday Inn Express Hotel and the adjoining Permanent House on the Albert Road frontage of The Cleveland Centre. 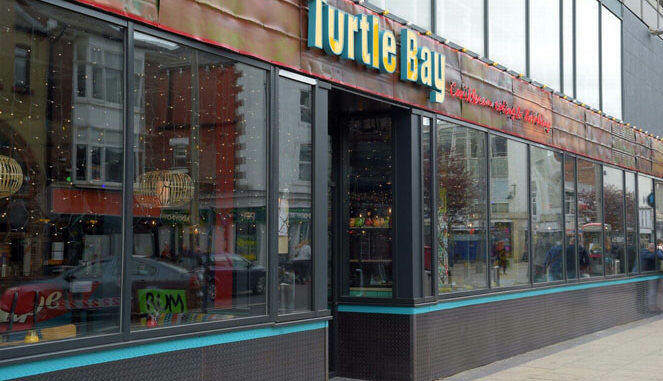 Turtle Bay also opened at the end of April, in the former ‘Walkabout’ unit on the corner of Albert Road and Corporation Road, in the heart of what will be a thriving centre of new cafes, bars and restaurants overlooking Centre Square and the Town Hall. “These two high quality restaurant chains have been attracted to Middlesbrough’s Albert Road because of its central location, a great outlook opposite Centre Square and the Town Hall, the proximity to the Holiday Inn Express and the opportunity for an outdoor seating area,” said letting agent Richard Wilson of Middlesbrough independent commercial property consultants Dodds Brown. Bistrot Pierre, which will open in July, is a fast-growing national restaurant chain offering French provincial cuisine in a relaxed atmosphere. Presently with 17 restaurants and plans to open a number more, Bistrot Pierre embraces French culture and love of food and celebrates all that is great about French cuisine in a classic bistrot atmosphere with attentive service. Caribbean restaurant and bar chain Turtle Bay is billed as a ‘Caribbean social’ where you can eat, drink and get take out, offering a range of dishes from jerk chicken to mountain curried goat and a huge cocktail menu. It presently has 34 branches and like Bistrot Pierre is looking to expand further. Mr Wilson continues: “We were instructed by Ashall Projects, the developers of the Holiday Inn Express, to find a high quality restaurant operator to sit alongside the new Hotel. “National chains had bypassed Middlesbrough in the past and it was clear to us we had to overcome this prejudice and also develop a new destination. We were able to put together a compelling case to show what a great location this could be for a new restaurant quarter for the town. The interest in Albert Road has been given extra impetus by the 21 room expansion of the Holiday Inn Express taking it to 159 rooms, the plans to transform Centre North East into more than 300 residential apartments, with a bowling alley on the first floor, and a Sky Bar on the 17th floor, Middlesbrough Council’s desire to regenerate the whole of Albert Road by giving it Enterprise Zone status, and its proposals for 250,000 sq ft of prime new office accommodation at Centre Square, all of which are expected to attract more businesses and potential customers into the area. Cllr Charlie Rooney, Middlesbrough Council’s Deputy Mayor and Executive Member for Regeneration, said: “On top of the success of the re-generation of Bedford Street as a location for independent food and drink operators, this new leisure destination on Albert Road will be transformational in the Council’s on-going regeneration of the centre of Middlesbrough. “It will both help attract occupiers to the proposed new prime office accommodation in Centre Square, and it in turn will benefit from the new offices.